Running for over a month and securing a worldwide viewership, it's no surprise that the World Cup was a global social media spectacle. 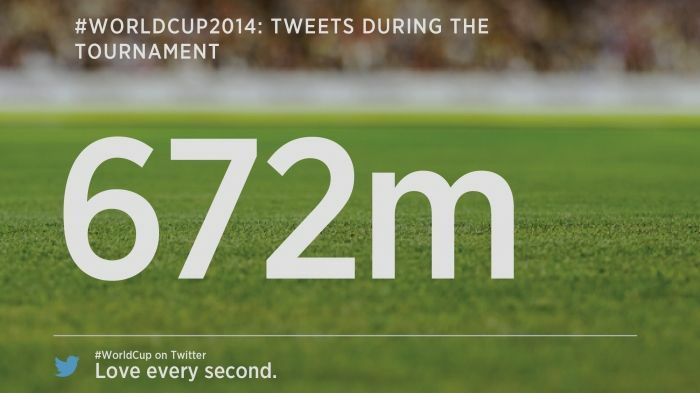 Twitter reveals just how big #WorldCup really was. Twitter has crunched the numbers and released swathes of data regarding World Cup tweeting, revealing that the global footie spectacle was by far the most talked about event in social media history. "Every minute of every day it seemed fans across the globe were discussing the drama of the tournament, though we saw the conversation really take off during each live match," says Simon Rogers, Data Editor at the social media giant. "When a thrilling moment occurred on the pitch, the world came to Twitter to talk about it." According to the stat report, the semi-final between Brazil and Germany saw fans send over 35.6m tweets, breaking the Twitter record for a single event. Unsurprising really, considering the 7-1 score that saw the Deutsch team break into the final bracket. Twitter also revealed that fans sent 618,725 tweets-per-minute (yes, that's a thing) when Germany defeated Argentina in the final game, making it the most tweeted moment of the World Cup. Brazil's spritely forward Neymar Jr. wasthe most-mentioned player during the World Cup, followed by Argentina's Lionel Messi. Luis Suárez came in at third place, likely thanks to his insatiable jaw.